This is a simple and effective way to relax and loosen up your hips quickly. 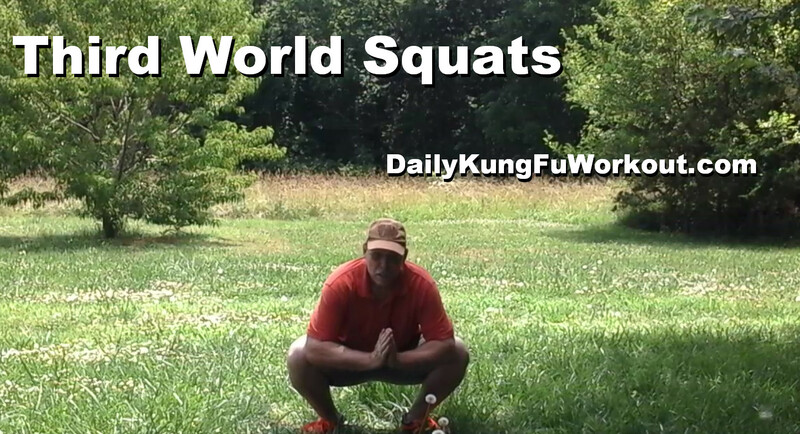 Third World Squats are so named because if you wander around an market place in third world nations you will see people squatting in doorways on streets or where ever they decide to stop standing. While in most developed nations we are used to sitting in chairs they are not. The downside for our easy access to furniture comes in the form of bad hips, bad knees and bad backs. Well all it really take to start reversing some of those issues is to simply cop a squat, Third World Squat. In this tutorial I demonstrate and beginning TWS and how to move into more advanced versions, that is wide foot spacing which opens and strengthens the hips more effectively. As martial artists having strong flexible hips is VITAL and TWSs are a great way to work on that. Start off holding the TWS for a few seconds at a time and progress to several minutes. Making sure to keep your back straight and your heals down. As you widen your feet both become easier. Give these a serious go and expect to feel some discomfort the first few days but as your body becomes accustomed it will get much easier.